During the first half of 2016, an array of new types of malware has infiltrated computing devices across the globe. Anyone who has paid attention to digital security threats has heard of ransomware, a form of malware that freezes your computer until you pay a ransom to relinquish the hackers’ control. A new form of ransomware, known as “crypto-ransomware,” has spread through corporate America and beyond with surprising ease. This new version of the dreaded ransomware malware is only getting nastier as time progresses. The numerous variants of ransomware and other malware have some industry experts touting 2016 as the year of the digital virus as well as the year of online extortion. The malevolent individuals behind these viruses are constantly working on new editions in an attempt to subvert anti-virus software and other virus prevention methods. These hackers are interested in more than merely causing computer chaos; a lucrative black market exists for new editions of malware. As we progress through the rest of the year and into the future, this black market will likely continue to expand. The interesting twist to ransomware is that it forces the computer owner to pay an exorbitant fee to regain control of his own machine, a form of online extortion that is a relatively new phenomenon. Those who fail to pay the ransom lose control of their computer as well as of all the sensitive data stored on it. The potentially massive financial losses prompt most ransomware victims to pony up the hackers’ requested fee. Crypto-ransomware is evolving from top to bottom. Cyber thieves are going to great lengths to customize the manner in which the ransomware attacks specific computers. They are personalizing many of the attacks to mess with the psychology of each particular victim. Many new versions of crypto-ransomware utilize scripts and macros, presenting seemingly professional web pages that are actually completely phony. Some are pressuring targets by altering a computer’s master boot record, crossing both platforms and networks. Even hackers who have favored other versions of malware in the past are hopping onto the ransomware bandwagon in an attempt to pressure targets into paying substantial amounts of money for a return to computing freedom. With the new year, a myriad of ransomware alterations have emerged from the crowded pack; of particular note is JIGSAW. This malware copies the targeted machine’s files, deletes all the originals and gradually destroys copies. KeRanger is the first-ever version of ransomware to successfully harm computers with Mac OS. PETYA completely overwrites a targeted computer’s master boot record, then locks out the user. MAKTUBLOCKER aims to gather private information from e-mail messages such as full names and addresses. The malware then uses this information to persuade the user into downloading the crypto-ransomware. PowerWare takes advantage of Windows PowerShell vulnerabilities. SAMAS / SAMSAM seeks out vulnerable Jboss servers and attacks them to encrypt network files. Perhaps the scariest of all the ransomware variants is CERBER. The evil geniuses behind this malware figured out how to include a verbal component that vocalizes the hackers’ demands for the payment of a ransom. You can prevent ransomware attacks, but it won’t be easy. Lean on the expertise of a savvy IT support group, and you will greatly reduce the odds of a successful attack. You can use one of a number of ways to fight back, from backing up data to updating anti-virus protection and educating employees about this nasty malware. Regularly updating to the latest versions of operating systems and software is another excellent way to ward off ransomware attacks. 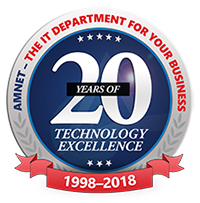 Amnet is the trusted choice when it comes to staying ahead of the latest information technology tips, tricks, and news. Contact us at (719) 442_-6683 or send us an email at info@amnet.net for more information.